Once you take the steps of simplifying, sorting and purging down your spaces, the next step is to organize! That process typically requires corralling/grouping items by type and purpose. 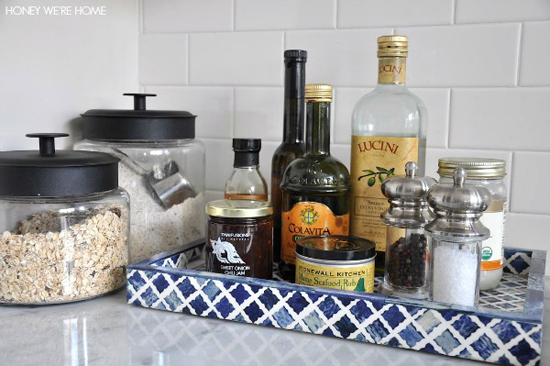 Baskets, bins and drawer organizers are the "go to" solution for this step, however, decorative trays are an ideal solution for keeping items used daily nice and neat. 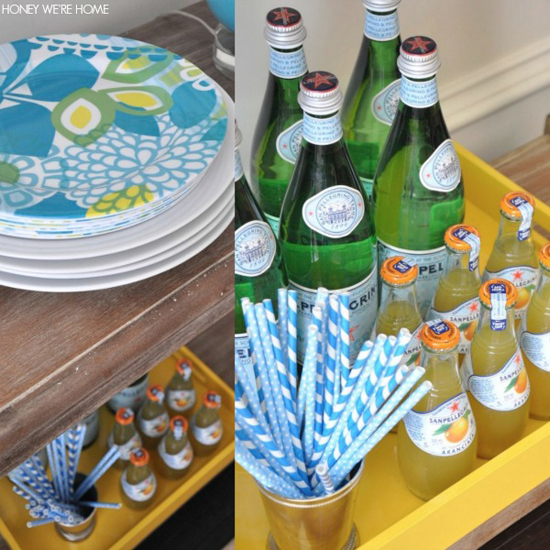 Megan of Honey We're Home blog agrees, and uses trays all over her home in beautiful ways. What I love most is that she always has quick and clever solutions for giving them a sweet refresh every now and again. She is here today to share how trays both decoratively and functionally all around her beautiful home. 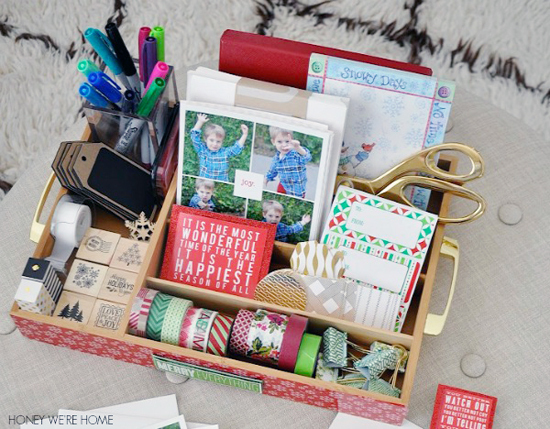 I'm so happy to be over here at Jen's blog today talking organizing. I've actually been on an organizing kick at my house since January when I resolved to tackle the 10 biggest problems areas of our house and hallelujah! I just completed #9 on my list, the Master Closet! It feels good to get those major spaces decluttered. But, sometimes just corralling small things or making little spaces more organized and pretty is very satisfying too. 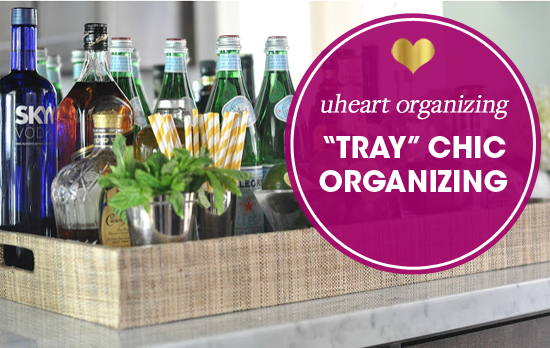 I organize and "make pretty" our home by utilizing trays in nearly every room. Are you with me that things just look better when they are sitting in a nice tray? In our kitchen, we currently have three trays defining our space. First up, this gorgeous blue and white bone inlay tray I picked up at HomeGoods. Such a bright, happy color goes perfectly on our white counters, sitting right by the stove and holding the spices and oils we reach for most frequently while cooking. (I also keep prepped ahead oatmeal and ground oats with flax for my protein pancakes in those jars to the side). Makes busy mornings run much smoother. 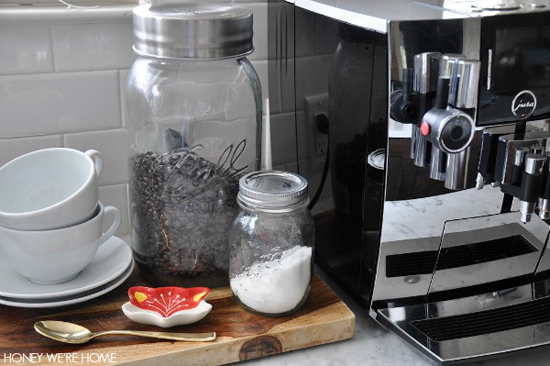 What kitchen would be complete without a coffee station? At least in my house it's a daily necessity! We don't have an elaborate set-up, but I do like to decant the coffee beans and sugar into glass jars. It doesn't take long and it's much prettier to look at. And a simple cutting board can function as a tray too. 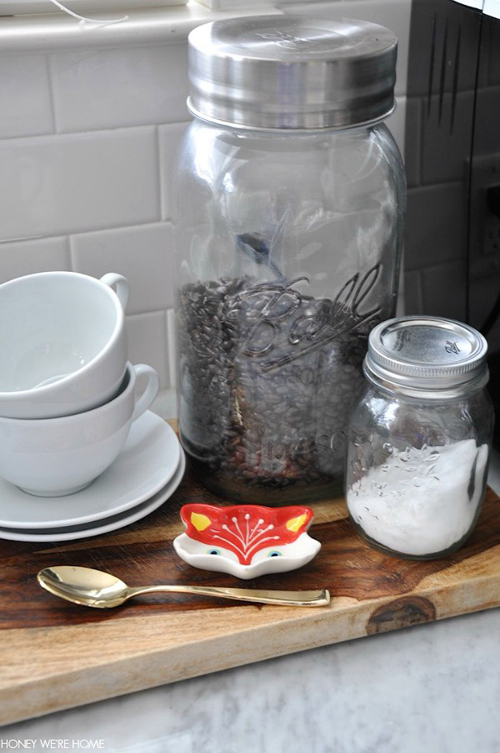 The cute little fox is a tea bag holder, but I like to use it for my spoon after stirring my coffee. I picked him up at Target. By the sink, we have a small white/clear plastic tray that holds our dish soap (again, decanted into an inexpensive oil jar and I love bright green soap!) as well as our hand soap. And now that SPRING is upon us, I can use my bright yellow tray from West Elm to hold a few bottled waters and paper straws. Combining decorative and functional is the goal. 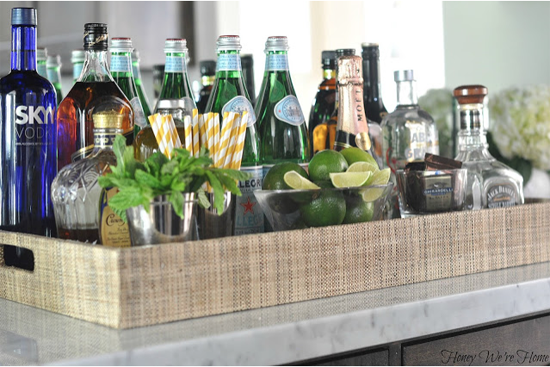 You don't have to have a bar cart to create a mini bar station in your home. A large tray can hold your liquor bottles, glasses, and other accompaniments. The natural raffia on this tray gives it a great texture. This mirrored tray from Target was a steal at $40. I've kept my eye out for another one, but so far I haven't seen it. We usually keep all.the.remotes here, but I wanted to show you how pretty the tray is without them. 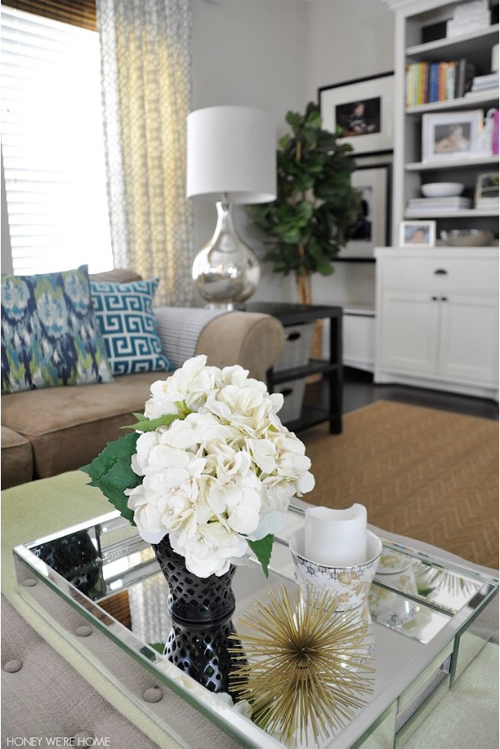 This reflective tray really brightens our living room. Of course, I do have to wipe a certain 5-year olds fingerprints off of it on a regular basis. For my birthday recently, some friends put together a spa gift basket (thank you!) and it came with this unique wooden decorative tray. I put it to use in my bathroom to hold my toiletries. Now when I'm getting ready in the morning, all my products are close at hand and I have the fond memory of a special gift from friends. Did you realize you can make a small tray out of a shoebox lid and duct tape? That's what I did with a sturdy shoebox lid and snakeskin patterned tape. Just cover the lid completely with the tape, aligning as best you can the pattern and pressing down as you go to push out any air bubbles. Have you seen all the different patterns and colors that duct tape comes in these days?! So many options. 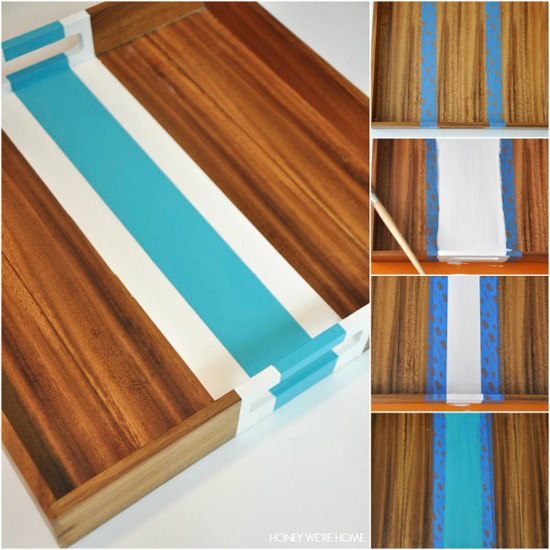 Or you can use fabric or paint to give a tray more personality. I added a feminine pastel fabric (shhh- it's a shower curtain from Target!) to the bottom of a rather boring brown tray and then topped it with plexiglas to protect the fabric from spills, etc. You can get the plexiglas at most craft stores and they will cut it for you for a nominal fee. To get the fabric cut just the right size, lay the plexiglas on top of the fabric and trace around it. 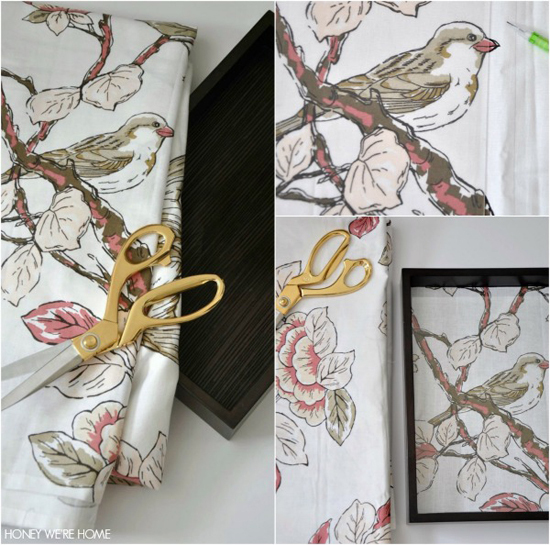 You'll be able to position your fabric exactly how you want to this way too. Finally, I modernized a traditional wooden tray with a couple of coats of craft paint. Just let the paint completely dry between coats and you shouldn't have any issues with paint peeling off with the tape. And don't forget, trays also make great stationary stations either during the holidays or even year round! I'm constantly switching out the trays in our house and always keep my eye out for good deals. Please tell me I'm not alone! I'm sure my husband thinks I'm a crazy tray (and basket!) lady. 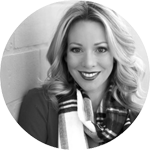 Thanks again Jen for letting me share some of my organizing tips here. I'd love to hear your ideas for tray transformations and how you use them in your house. "tray crazy" I love it!! What a fantastic idea! It's so simple, yet I never would have thought to keep everything on trays (even though I do it for my jewellery). I have a couple of lovely vintage ones knocking around from my great-aunt, too . . . I'll be fishing those out this weekend! Girl, you better pull those out stat! I bet they are awesome! Thanks Carmelita! I'm probably banned from buying more trays in our house, but I still keep looking! Thanks, Megan, for all your tray tips. I love doing the same thing with clutter. It's amazing how decorative just arranging things on a tray or basket can be a real statement. This is illustrated in your beautiful mirrored tray. I'll bet it's the first thing people notice when they enter your living room. One of my favorite containers to use in my rustic home are old sewing machine drawers. I have one at my bathroom sink for cleansers, toners, etc. And one near my favorite living room chair to corral my journal, daily Bible study guides and my Ipad. I use a huge wooden turntable near my stove to put oils and vinegars on and a double decker one for my butter bell, salt and pepper, sugar jar, etc. The ways you can use trays are endless! The turntable is so useful! We use one in our pantry and it's so helpful! I have recently started bible journaling, so my bible and art supplies are in a basket in the living room too. love it! We use the same white plastic tray for our dish soap (target!) 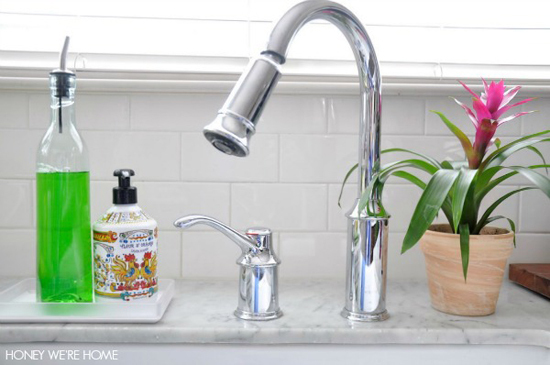 because its sooo much easier to pop that thing in the sink and rinse it put than to try to get glops of soap off of the counter tops! I also just picked up a $3 galvanized bin from the Target Dollar Spot to hold my dogs leashes and paw wipes. I hate having anything out and seeing clutter because we live in a small townhouse with minimal counter/tabletop space, but sometimes it just has to be in a grab and go spot to be functional. And I agree, bins and trays and baskets make it more tolerable! I agree about the keeping the counters clean, we do have to wash that tray out frequently. The Target Dollar Spot is so good!! I so wish I could get on board with trays! These posts looks so beautiful but when I implement them in home I still feel like it's just visual clutter in a cute corral. I think my super minimalist style might not let me participate in this trend! I can relate to that! Sometimes I crave an ultra minimal space too with nothing on the counters. I did that after the holidays two years ago and it was awesome for awhile. These are great ideas for clustering/corralling like function items! I need to find something for my kitchen - my current holder is cracked and round shape doesn't quite work! Thanks Jen and Megan for the inspiration! So many shapes of trays to choose from- I think I've seen a hexagon shaped tray at Target recently. I love an organized tray! Very cute! Lovely photos here! I definitely need some trays around my home. Thanks for the inspiration! I hear what Nicole Hokenstad is saying: visual clutter can annoy me. BUUUUUT, using (just a few) trays this way in my kitchen has allowed me to override my anti-clutter tendencies and keep a few always-reached-for items on my counter. I love this strategy. Thanks, Megan! I love the new HomeGoods tray you have. I'm just curious about the cost of these trays. What do you consider a "good" price for one? For example, was the blue HomeGoods tray under $30? No, the blue one was definitely a splurge! Even at Homegoods it was $49, but that's still such a better price than it would sell for regularly. 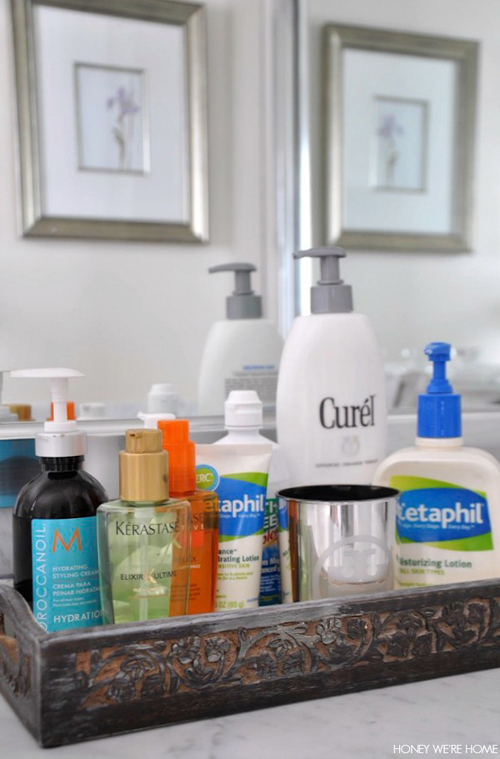 Love the idea of organizing with trays, especially in the bathroom. And that mirrored tray is awesome!! The mirrored one is definitely a favorite of mine! 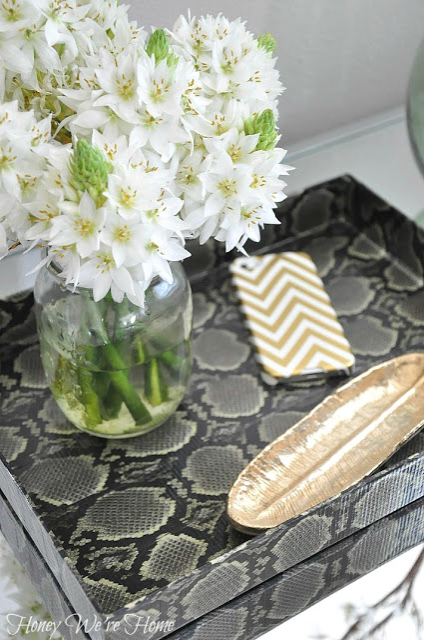 Love the snakeskin tray, and can't believe you made it with duct tape and a shoebox lid!! Gorgeous, Megan! I'm always looking for cool ways to organize all the stuff i've got lying around, so this is really helpful! Glad this post helped Melissa! Have a great day! I love the mirror tray! It is so gorgeous. I'm always on the look out for trays. I've found some nice trays at TJMAXX. I'm going to make one with duct tape now! Thanks for the inspiration. You're my hero - I'm so organizing everything in trays right this second. P.S. a shower curtain! ?> whoda thunkit? Love these ideas! What kind/brand of lid are using with the coffee-filled Ball mason jar? Really wish I could find that fox tea bag holder. So cute! So inspired by how you've used your trays! 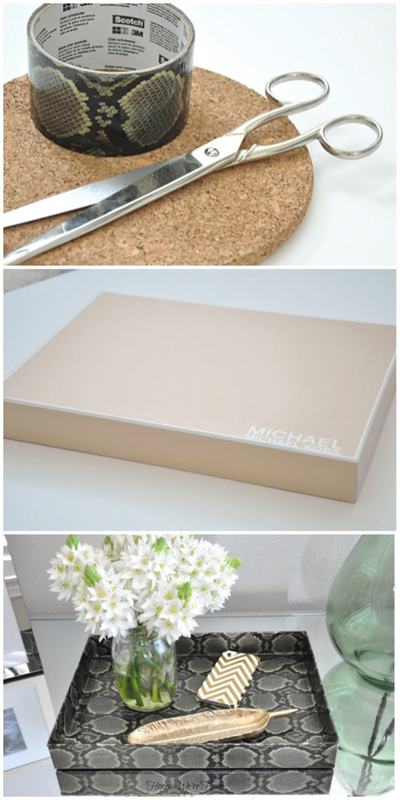 I'll definitely be looking for ways to incorporate this into my spring home organization. I think the mirrored trays are my favourite :). Must get my hands on one! What a great post! Thanks for the encouragement to corral our counter items. I have a wooden shaker style tray on our island, where we keep a few receipts, a hobnail glass change jar, and dog treats in a ball jar. I don't have other trays, but this has inspired me to pick some up! I LOVE trays! They are great for keeping papers "to be filed" or "to be scanned" in order as well. I also love them for remotes on the coffee table or medicine on the night table. You can never have too many! Seriously amazing and inspirational! I just picked up some trays at the thrift store to update. I can't wait to try some of your tips and add them to my home -- especially the bathroom and office. Megan, this is awesome! I love using pretty trays for organizing. So easy to clean up when you can carry the stuff away. Pinned it twice! Would love it if you'd share this post at my Wonderful Wednesday Blog Hop this week. It is sure to be a favorite. These are all so lovely! I love using trays but now I am inspired to use more! This is great, I always have to remember to keep trays functional. I like them to just be pretty and clean, but I NEED them to be more useful. I can't wait to try out some of your try DIY ideas. thanks so much for this post! Inspired.